– Updated on December 6th, 2018 – Visiting Bangkok for the first time can be overwhelming, and planning a trip to this bustling city is a real challenge. Thailand’s capital is a mix of ancient culture, food paradise, and shopping heaven, but to get it right is not that simple. After so many emails from readers asking us to help them planning a Bangkok itinerary, we decided to list the best travel tips for your first time in Bangkok: what to do and where to stay. This is an ultimate travel guide to Bangkok [a long one], with all the top attractions, best places to stay in Bangkok, how to get around, scams to avoid, and local experiences. Bangkok has been our “home” in Southeast Asia for more than a year, and every time we arrive there we discover new things to do in Bangkok. But we also love to visit the traditional attractions, places that make Bangkok such an iconic city. There are tons of things you need to do to organize your first trip to Bangkok. Have you booked your flights to Thailand? Not yet?! You can find the best prices and connections at Skyscanner. Did you organize your travel documents? No!! Before flying check all the documents you must have for an international trips and avoid problems. 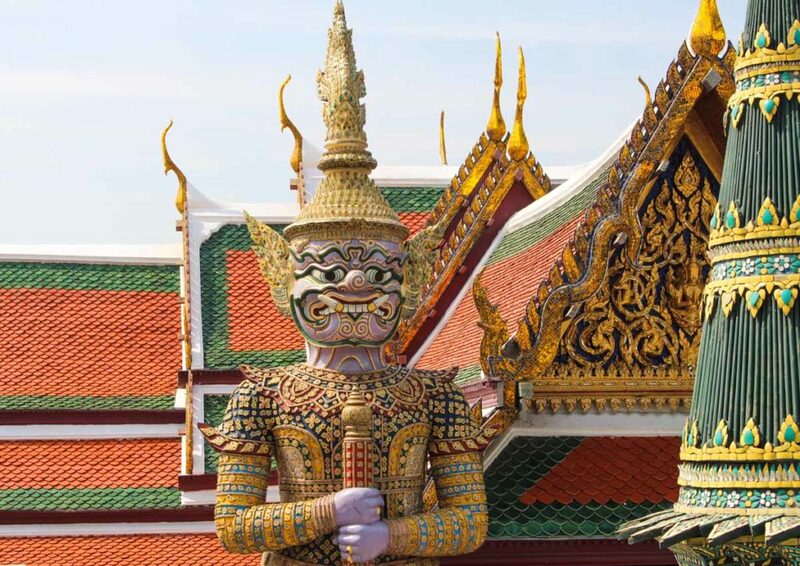 Now back to our travel guide to Bangkok, what to do on your first trip to Thailand! We gonna start with what to do in Bangkok, attractions that you can fit in a 4 or 5 days itinerary. So sit back, relax and let’s plan your first trip to Bangkok! First Time in Bangkok: What to do? First of all, when is the best time to travel to Bangkok? Plan your trip for the dry months, November to February. From March to June is the hot, super hot season but if you have the chance to be in Thailand around April go for it! It happens the Songkran the Thai New Year an amazing celebration! From July to October are the rainy months. The monsoon is not so bad, we have been in Bangkok during all seasons and the hardest one was the summer. Most of the top attractions in Bangkok are temples or religious sites, my advice for your first time in Bangkok is to visit the main temples and the Grand Palace in the same day. The sights are quite close to each other, and as you need to dress respectfully [cover your shoulders and wear long skirts or pants] make sense to schedule them for the same day of your Bangkok itinerary. There are hundreds of temples in the city, we gonna recommend the most famous and most beautiful ones, attractions that you need to visit on your first trip to Thailand. This is the number 1 attraction in Bangkok, to avoid the big groups it’s better to go early in the morning. 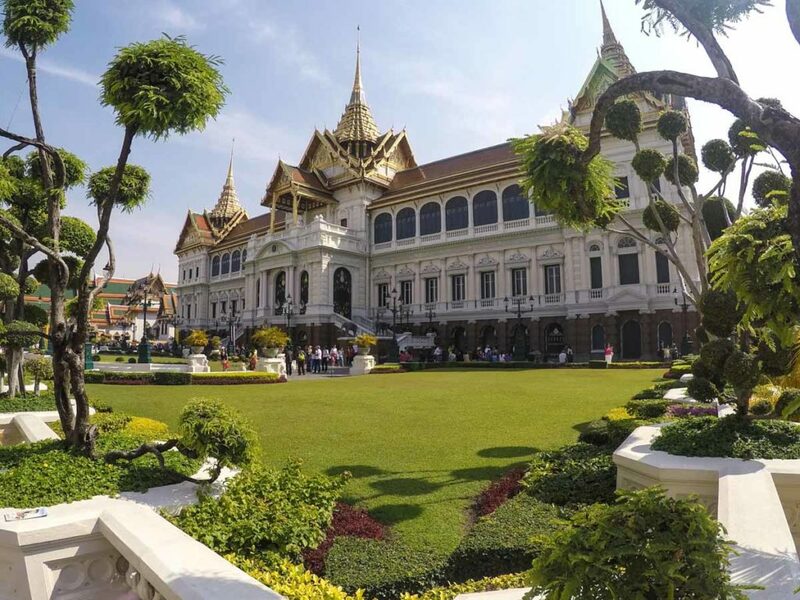 The complex is huge, inside the Grand Palace you can visit the famous Wat Phra Kaew and the Emerald Buddha, plus the gardens, the Royal offices, amazing statues and Thai designs. The Grand Palace is open daily from 8:30AM to 3:30PM, and a quick visit can take more than two hours, so be prepared to walk. Check the Grand Palace website for prices, location and about the dress code. If you want to make your first visit to Bangkok a learning experience, rent an audio guide at the entrance and follow the history behind each temple and building of the Grand Palace. Wat Pho is right beside the Grand Palace, and it’s one of the Bangkok’s main attractions. If you wake up early, you can visit the Grand Palace and the Wat Pho in the same morning, it’s a smart way to save time on your first trip to Bangkok. Wat Pho is another huge complex, with many corridors, stupas, statues and a nice garden. 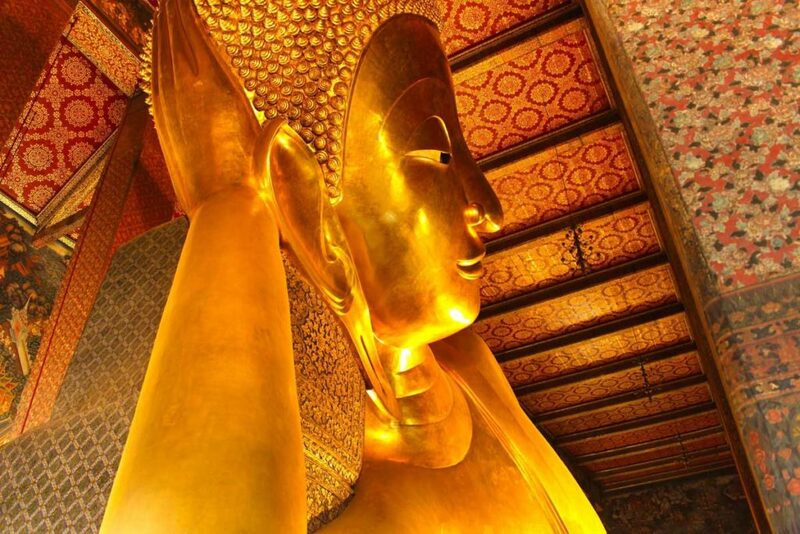 The biggest attraction is the Reclining Buddha, 15 meters tall and 46 meters long, all covered in golden leaf, impressive! The Wat Pho Temple is open every day from 8:AM to 5:00PM, for more info on how to get there, entrance fee, and about the Thai Massage University that is located inside the temple check the Wat Pho official website. On your first time in Bangkok you must visit the Wat Arun, also known as the Temple of the Down. You will be mesmerized by the beauty of the temple. On the banks of Chao Praya River, Wat Arun is almost in front of Wat Pho and to get there you need to catch a public ferry that crosses the river. It’s a great experience, specially if you climb the 67 meters high pagoda. The stairs are steep, but the view you have from the top is stunning. The Wat Arun is open daily from 8:30AM to 5:30PM. If you are tired of walking and just want to admire the beauty of Wat Arun, grab a table at the Sala Rattanakosin Rooftop bar and relax while watching the sunset. The sun sinking behind the temple will be a highlight of your first time in Bangkok! It’s not listed as one of the top attractions in Bangkok, but should be. I love the architecture and design of this temple, especially at night-time when it is all lighted up. The temple opens daily from 8AM to 5PM and it’s free to enter. > Floating Market, the real one, not the tourist trap! 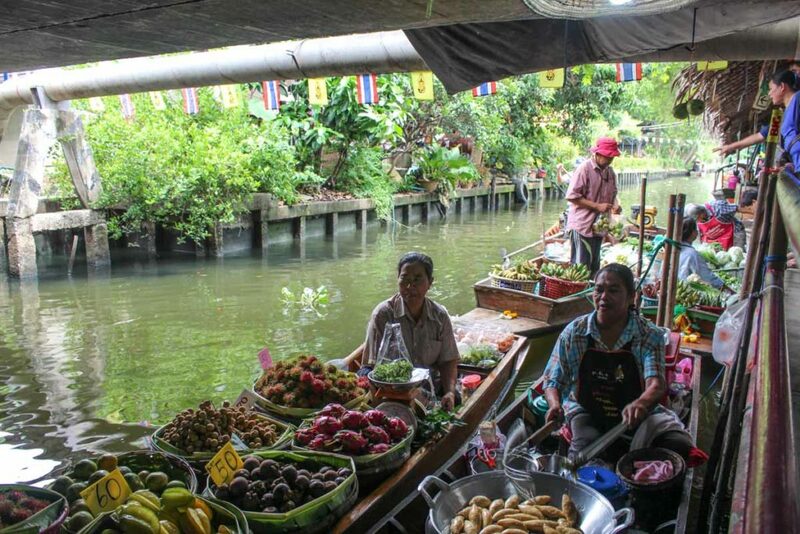 Boats full of fruits and veggies, people trading on the banks of the canals, the smell of Thai food in the air… This is what you get when visiting a traditional floating market in Bangkok. But not all the floating markets are worth the visit, some of them are real tourist traps. As all the floating markets are outside Bangkok, you will need a tour or a guide to take you there. The problem is that most of the tours will take you to the super tourist markets, with boats filled with groups, souvenirs and selfie sticks. We have visited some floating markets in Bangkok, and I was kinda disappointed, until my last experience. We choose a tour called A Perfect Floating Market Day with Take Me Tour, and love it. The name of the tour set some high expectations, but Maitree [our guide] and his family didn’t disappoint us. 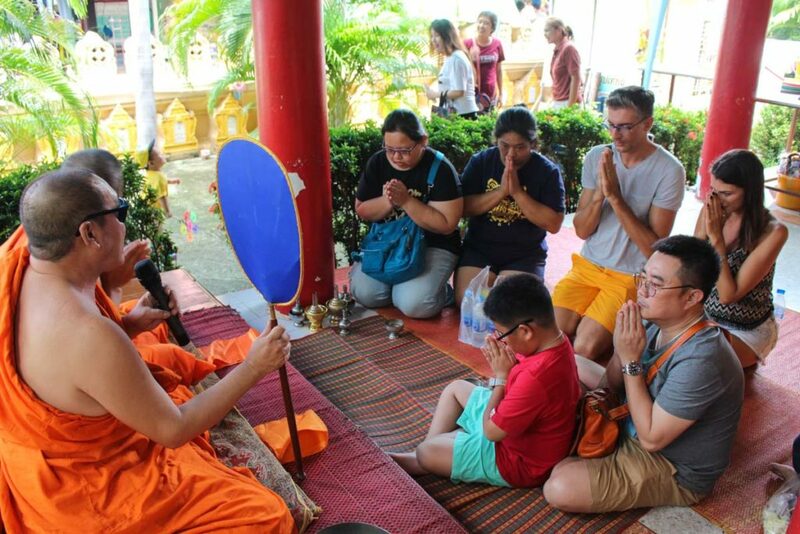 If you are traveling to Bangkok for the first time, this is the type of experience you need to have, a proper introduction to the Thai culture. Maitree is an enthusiast of Thai culture and food, we met him at the BTS station and head together to the Klong Lad Mayom floating market. After few minutes driving we parked on a dirt road, full of people carrying bags, kids playing and enjoying the Sunday. The smell of food, the color of the fruits, and the sizzling sound coming from the wok pans were amazing. It was a sensorial experience, delicious in every sense, perfect for a first time in Bangkok. The wet market on the banks of the canal was just the beginning. After tasting some Thai sweets we caught a longtail boat and started a tour through the canals. Our first stop was in a temple, where we witness a ceremony and even received a blessing from a monk. Our guide explained the ritual, how we should behave and what the monk would do. So we took off our shoes, grabbed an offer to the temple, and got down on our knees. A unique moment that made me feel close to the Thai culture, a moment when we didn’t feel like tourists, but actually like locals, surrounded by friends and families. The boat kept navigating through the narrow canals, with twists, turns and some splashes of water. Second stop was in an Orchid Garden and then we were back to the market. On the way, we passed by boats with monks, people selling food along the canal, and some wooden Thai houses that were truly masterpieces. On the market we bought take away food and head back to Maitree’s grandma house, a traditional Thai house overlooking one of the many rivers in Bangkok. And there she was, Grandma, 81 years old, a big smile and eyes full of wisdom. I can’t speak Thai, she can’t speak English, but we got along very fast. She hit up the wok, and started preparing the Pad Thai [one of my favorite Thai dishes], showing me the ingredients, how to maneuver the pan, stir fry the prawns and the noodle. She made everything looks so easy and yummy. Then it was my turn to face the wok, and show that a Brazilian girl can cook Pad Thai. The heat from the fire, the hot pan that I had to hold, the endless stir frying movements made me sweat. But yes, I cooked a Pad Thai, not as fast as grandma, but delicious. We recorded a video of my cooking skills, check it out! We had a feast: Pad Thai, grilled fish, papaya salad, fish tartar, tropical fruits and Thai sweets. A table full of flavors and laughs, an amazing experience. So now you know, on your first trip to Bangkok, you must do it right, visit a real floating market, and learn how to cook a Pad Thai. Book a tour that will be worth your money and time, and that will give you memories for life. The address of delicious food, interesting shops and a truly Chinese vibe. 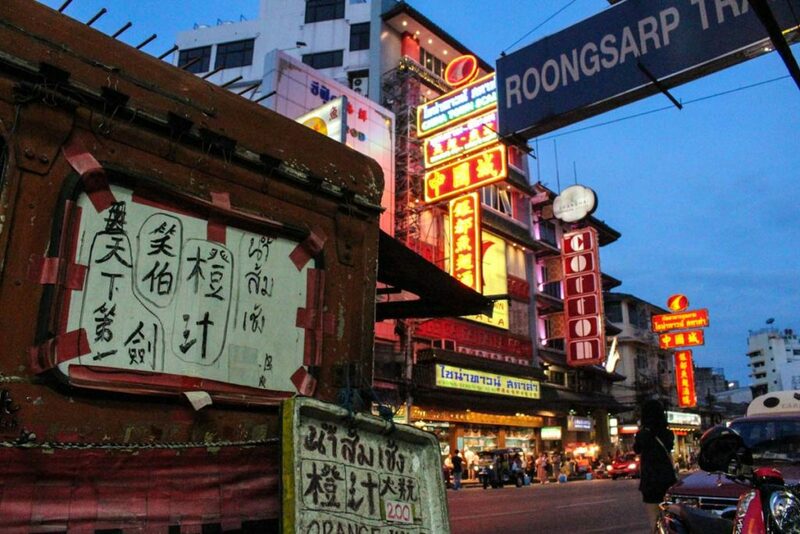 Chinatown is a different world, especially if you venture yourself beyond Yaowarat Road. Explore the streets and alleys, visit the temples, try street food and desserts. Visit the shops to buy tea, herbs and a lot of strange stuff that you can only find there. Arrive in Chinatown before 5:00PM and visit the Wat Traimit Temple, there you can see the largest gold Buddha in the world, 3 meters wide and 3.91 meters tall. It’s beautiful! A travel guide for a first time in Bangkok won’t be complete without a visit to the Jim Thompson House. In the middle of the busiest area of Bangkok, the house/museum is like an oasis, full of green, arts and legends. Go there to admire the silk work and legacy of Jim Thompson, also to discover conspiracy story behind his life in Thailand. In the heart of Bangkok, Lumpini Park is the green escape for locals and tourists. My suggestion is to go there early in the morning, around 7:00AM, so you can admire the groups doing Tai Chi Chuan with swords, yoga class for all ages, people exercising in the middle of the garden, and the huge monitor lizards strolling around the park. On your first time in Bangkok you must cruise the Chao Phraya River. There are plenty of ways to it: private boat, dinner cruise, or even on a normal public transportation boat. It all depends on how much do you want to spend and what type of experience you want to have. 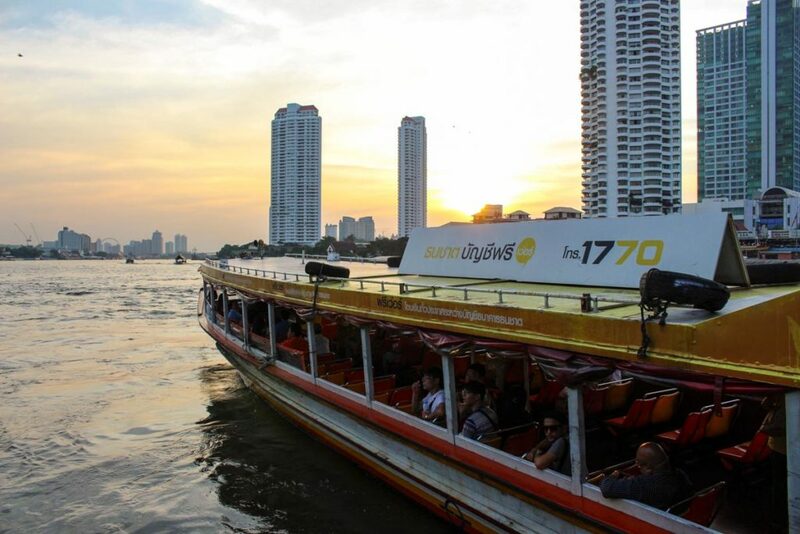 If you are looking for something more romantic on your first time in Bangkok, go on a private longtail cruise. The best place to catch a boat is at the Sathorn-Taksin Pier [Central Pier], there you will find many boats waiting for tourists. Don’t forget to negotiate the price, the average is 1000 Baht for one hour tour. Or you can hop on the Chao Phraya Express Boat and commute along the river with other tourists and Thais. The blue flag boat is the tourist route, and the yellow or orange flag are the regular public transportation. More than a sport, Muay Thai is a tradition in Thailand. If during your first time in Bangkok you want to watch a real Muay Thai fight go to Lumpinee Stadium or Rajadamnern Stadium. Check on their website the dates/time of the fights, and book the ticket online. Please, don’t buy the tickets from any vendor in front of the stadium, only at the ticket booth. There are plenty of scams happening there, you can end up paying the double of the price, or getting a fake a VIP ticket. This is one of the most famous addresses in Bangkok. Khao San Road is known for the backpack scene, the bars, cheap drinks and street food. Some people love it, others hate it, that’s why on your first time in Bangkok you must go there and take your own conclusions. If you want to buy souvenirs this is one of the best places to go in Bangkok. During the day the street is packed with shops selling all types of crafts, clothes, tours, tattoos and much more. At night time, the bars stretch their tables and chairs over the street and Khao San Road turns into a big party. If you like electronic music, techno and deep house [like us], the best bet is the Best Bar. Bangkok has fine dining, international cocktails and views to die for. My recommendation for your first time in Bangkok is to go to a rooftop bar at least in one night. Be prepared to spend more than usual and dress nicely. The best rooftops in Bangkok are Vertigo and the Moon Bar at Banyan Tree Hotel, Sky Bar – Lebua at State Tower [that became famous after the movie Hangover 2], Octave Rooftop Bar at Marriott Hotel, and the traditional Three Sixty at the Millennium Hilton Bangkok. If want to dine at one of them you must book a table in advance. There are plenty of rooftop bars in Bangkok that are less famous, less crowded and less picky with the dress code than the ones I mentioned above. I love the Park Society & HI SO at SO-Sofitel. 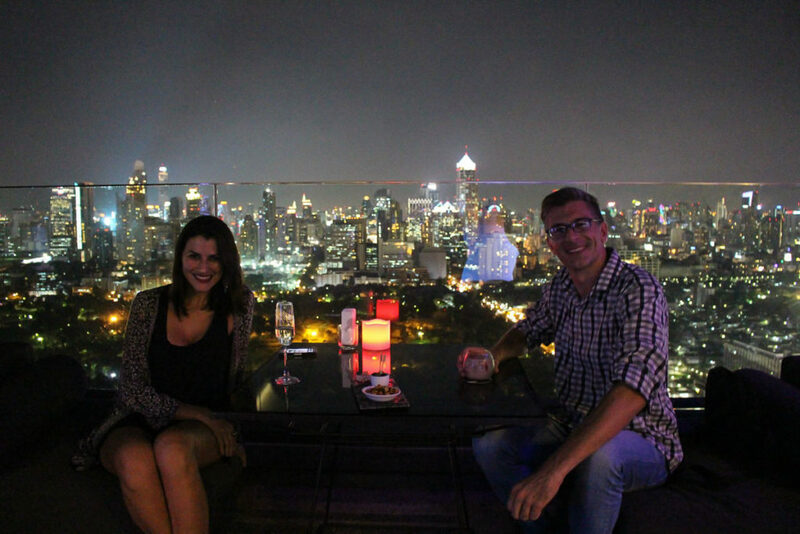 It’s has a jaw-dropping view of Lumpini Park and Bangkok skyline, a beautifully decorated place and great cocktails. We are halfway through of our first time guide to Bangkok. Now it’s time to talk about markets and shopping malls, because on your Bangkok itinerary you can shop till you drop. First time in Bangkok: Where to Shop? In Bangkok you can find shopping centers and markets for all tastes and pockets. From vintage clothes and antiques to trendy Asian designers and international brands. Bangkok is a shopping paradise. But before hitting the modern shopping malls, there are two traditional Thai Markets that you need to visit on your first time in Bangkok. 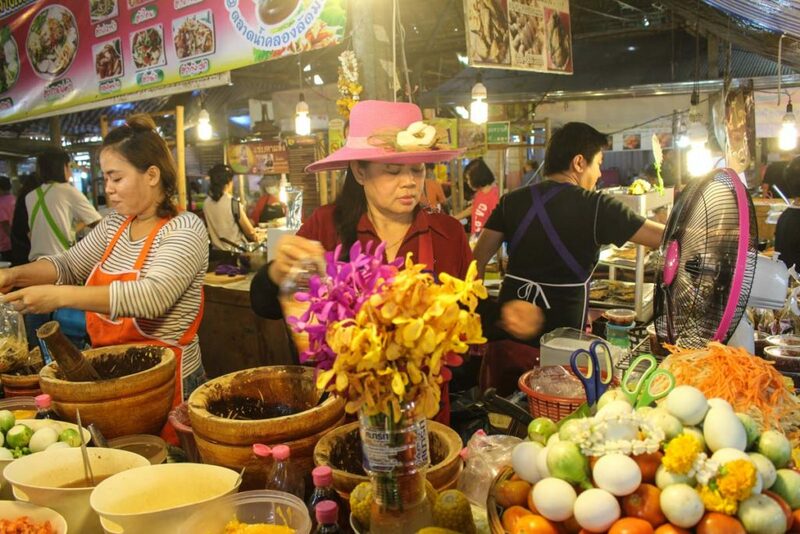 Chatuchak is one of the biggest weekend markets in the world, a complex that covers a 35-acre area, with more than 8 thousand stalls, and on normal days over 200,000 visitors will be shopping there. A visit to Chatuchak Market is a must on your first time in Bangkok. What to do when you arrive there? Try not to get lost and buy a lot of cool stuff. Clothes, furnitures, crafts, food, home wear, they even have a section for plants and a place to sell animals. Chatuchak is insanely huge! It’s opened on Saturdays and Sundays, from 9:00AM to 5:00PM, go early in the morning to avoid the crowds and the heat. 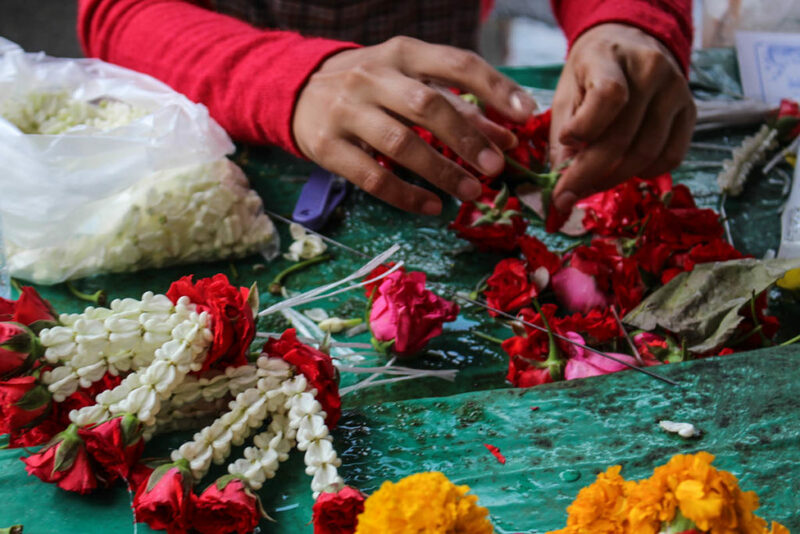 A universe of colors and scents, the Flower Market in Bangkok is an intense experience, but sadly many travelers that visit Bangkok for the first time don’t go there. The market is open 24 hours, but it’s after midnight that gets really busy. If you don’t wanna miss your bedtime, go to the flower market around 7:00PM and you will be able to see the ladies working on the bouquets and garlands. The best places in Bangkok for shopping are around Sukhumvit Road. There you find Siam Paragon, Central World, MBK [the electronic paradise], and the super posh EmQuartier. Sukhumvit is also the address for bars and night clubs, so keep in mind that during your first trip to Bangkok you should spend a couple of hours there. Asiatique is a complex of restaurants, shops and fun, all in a trendy open-air mall built on the south banks of Chao Phraya River. To get there the best option is to go to Sathorn – Taksin Pier and from there get the free shuttle boat to the mall. First time in Bangkok: Where to Stay? This the business area of Bangkok, with good restaurants, shopping malls and close to Lumpini Park. It’s one of the best places to stay in Bangkok for the first time because it’s close to many attractions and it ‘s connected by the BTS (Skytrain) and MRT (underground metro). With all these facilities and a premium location, hotels in Sathorn tend to be a bit more expensive, but great! Two of my favorite 5-star hotels in Bangkok are located in Sathorn. No words to describe the impeccable service and classy décor of Oriental Residence Bangkok, we had a romantic stay there and love it. Another great option is the So Sofitel. With a design that mix French haute couture and Thai heritage, So Sofitel is artistic, fashion and funky. It’s not your regular 5-star hotel, it has a unique twist and one of the best views from Bangkok. This is the best place to stay in Bangkok for shopping! All the malls and the streets stalls are on your doorstep. It’s one of the most touristic areas in Bangkok, and also a place you can find any type of accommodation, from luxurious hotels to budget rooms. Around Pratunam, we love Amari Watergate Hotel, it is modern, super comfortable, surrounded by shopping malls, BTS line and even close to the Airport Link train. It’s a perfect option if you want to be in the middle of the action but have a perfect place to relax. We stayed in the Executive Suite, and enjoyed the happy hour with free drinks and food at the Executive Lounge. Did I convince you? Check out the post we wrote about our experience at the Amari Watergate. Here is a list we made for you with more options of hotels in Pratunam area. Sukhumvit is a huge avenue that goes from West to East in Bangkok, but there is a particular area that is famous for shops, restaurants, bars and good hotels. We are talking about the area between the Nana and Phrom Phong BTS stations. There you can find thousands of hotels from luxury to budget, from international brands to local boutique hotels. If you fancy a local hotel with a comfy and modern style, Citrus 11 (book here with Booking.com or Agoda) might be a good option. Novo Hotel (book here with Booking.com or Agoda) also has a superb location at Sukhumvit 20, right off Ekkamai BTS station with stylish rooms. If you are looking for a spacious and fancy stay, S31 Hotel (book here with Booking.com or Agoda) has double floor apartments overlooking the city. We made a list of the best hotels in Sukhumvit area, pick your favorite and book now. 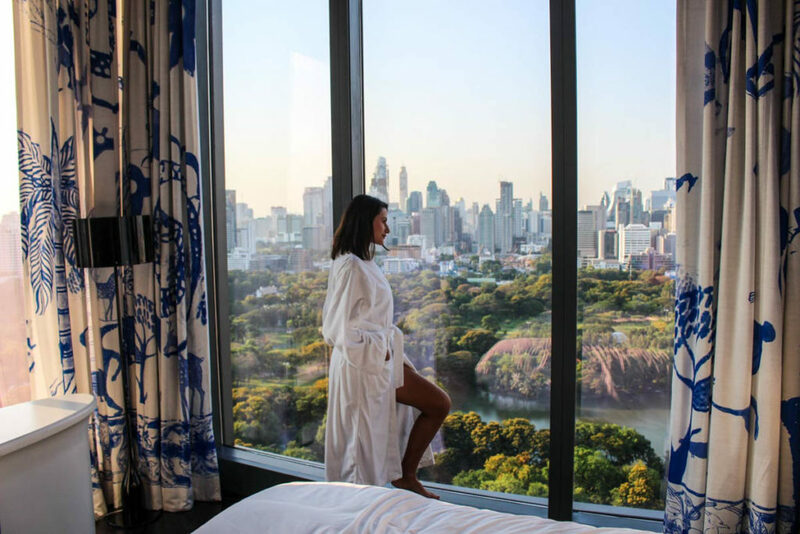 It’s not a common option for travelers visiting Bangkok for the first time, but it can be an incredible experience if you choose the right hotel. Shanghai Mansion Bangkok is a good example of a unique experience in the middle of multicultural Bangkok. Chinatown is also the address for many 3 and 2 stars hotels, you can save up on accommodation and spend on the delicious food you will find around the neighborhood. This is the premium address in Bangkok, the banks of Chao Phraya River are filled with top hotels and boutique guest houses. It’s one of the best areas to stay in Bangkok, and also one of the most expensive. The Peninsula, Shangri-la, The Siam, Mandarin Oriental, Royal Orchid Sheraton, Chatrium and Sala Rattanakosin are just a few of the international hotels lined up on the riverside. Khao San Road and Rambutree street are known for being the cheapest area to stay in Bangkok. 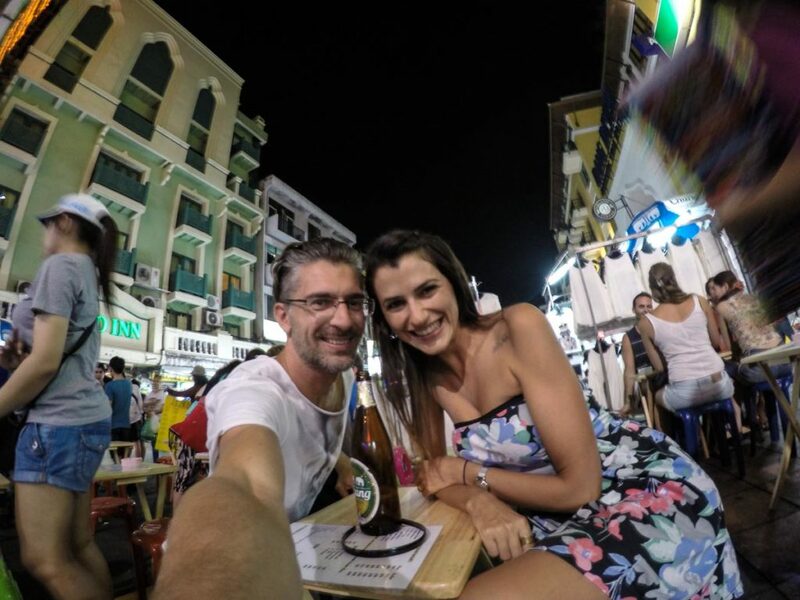 I agree and disagree, I prefer to say that Khaosan road is the best place to stay in Bangkok if you want to be surrounded by bars, street food, close to the historical attractions and experience the backpacker scene. It’s not only about budget, because you can find cheap and good hotels all around Bangkok. The problem with Khaosan is that not all the hotels are as good as they seem to be on the website. What looks like a cosy & clean room, can be a dirty cubicle, without windows and some cockroaches. Of course, there are good places in Khaosan, our favorite is A&A Guest House, clean, comfy, good value for money and breakfast included. Need more options of budget places to stay? Check out our suggestions of hotels for your first time in Bangkok, and in Khaosan Road. First time in Bangkok: What to do when you arrive? You’ve made to Bangkok, arrived in the airport safe and sound, and now?? The first thing you need to do after passing the immigration is to buy a local SIM Card. Believe me, you will need internet connection to explore Bangkok, to get taxis, check the public transportation and find on Google Maps that nice place I recommended. Look for a DTAC shop, there you can get the Happy Tourist SIM card, it’s easy, fast and reliable. The staff from the shop can help you with the settings and you are ready to go. Choose between the 7-days plan [300 Baht] or 15-days [700 Baht], both with unlimited internet plus calls. You’ll get great coverage all around Thailand. Did you see my video cooking Pad Thai? It was a Facebook Live video using DTAC 4G signal. Bangkok has two airports. Suvarnabhumi International Airport is the biggest one and from there you can get a train that brings you to the heart of the city where you can connect with other public transportation, or get a taxi to your hotel. Make a map from the airport to your hotel address, it will help you choose the right train connection and even help the taxi driver to find your place. Don’t get a taxi straight from the airport to your hotel, you gonna get stuck in traffic for ages and that is something we don’t want for your first time in Bangkok. If you land at Don Muang Airport, you can get a taxi from the terminal to the BTS Station Mo Chit [ask the drive to take the tollway, it will be a 50 bath more expensive, but you will save time]. From the BTS station, you can reach almost everywhere in Bangkok. If your hotel is on Sukhumvit or Sathorn area you definitely can go by train. If you are staying at Khao San Road, Chinatown or somewhere along the riverside, then a taxi might be the best option. Use the map on your cell phone and find your way. The BTS, MRT, taxis and tuk-tuks are the transports available in Bangkok, and you can use all them, just be careful. Taxi drivers tend to not use the taximeter [they ask for outrageous flat rates] and most of the time they don’t have a clue about the address. So download the GrabTaxi App or Uber on your phone, it’s fast, safe and you will save time and energy. First time in Bangkok: Where to eat? What to eat? Thai food is delicious but can be a challenge for first time travelers, especially if you are not used to spicy food. It’s hard to suggest places to eat as we all have different tastes, some of us are vegetarian, others have food allergies [as me]. We never had a problem eating street food in Bangkok, and we love it. Before ordering have a look around the food stall, if it looks clean enough, if there are plenty of Thais eating there and if the food looks good, then give a try. Our favorite street foods are: Pad Thai, Som Tam [papaya salad], Massaman Curry, Braised Pork Noodle Soup [the best ones are the food charters in front of the 7-11 shops], Fried Rice, Chicken Satay, Tom Kha Gai Soup, Tom Yum Soup, and for dessert Sticky Rice Mango and Roti. Here is a list explaining all the Thai dishes we mentioned and many more. As much as we know Bangkok, having the company of a local who loves the city and Thai food is priceless and will make a world of difference. If you want a Thai Food extravaganza accompanied by a local check out this “Gordon Ramsay’s Favorite Thai Food Tour”. 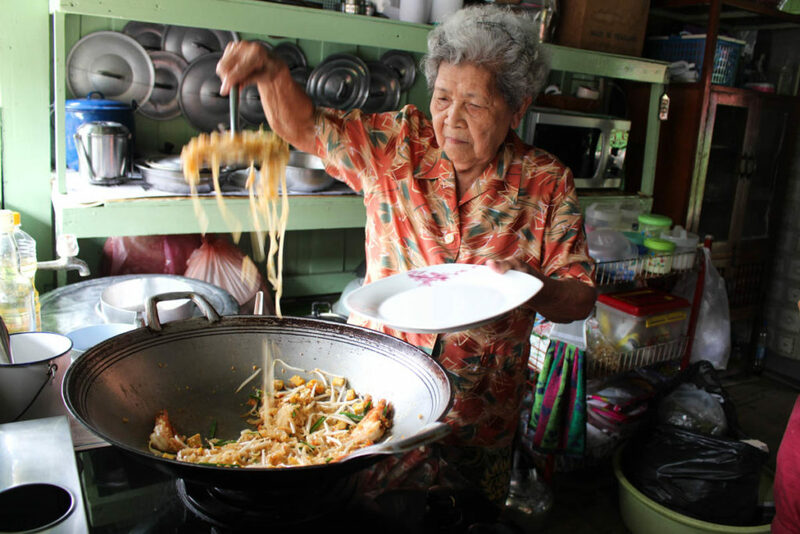 You gonna taste 10 delicious Thai dishes while exploring the local Bangkok with a foodie, and what is cool about it is that this platform gives you the flexibility to customize the tour according to your preferences. 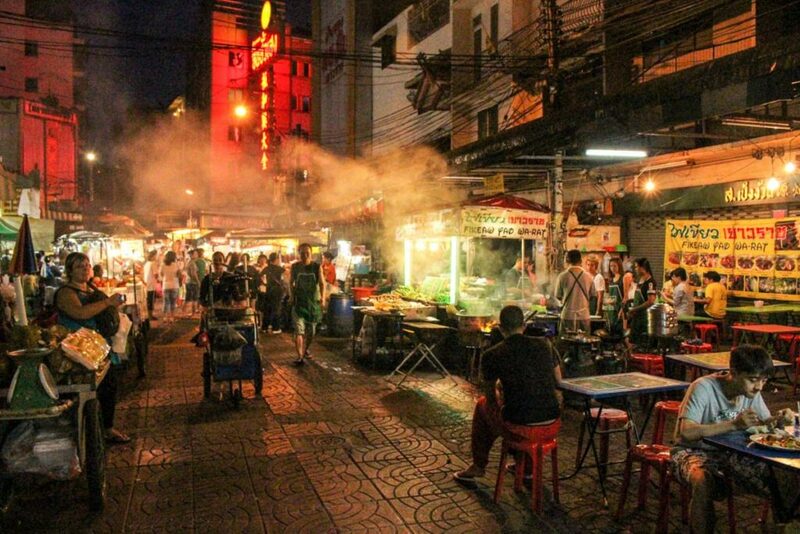 Chinatown, old town, Khao San Road and Sukhumvit are the best places to try street food on your first time in Bangkok. If you are vegetarian or vegan, my favorite places are Ethos Restaurant or May Kai Dee, both close to Khao San. Also, don’t forget to try the fruits and juices, it’s safe to buy them from the stalls on the street. For western cuisine the options are endless too, my recommendation is to check here which are the trendiest places and give it a go. First Time in Bangkok: What to do to be safe? Thailand is a safe country, but as in any other big city, in Bangkok you must look after yourself. So, on your first time in Bangkok, what to do to be safe? Before even arriving in Thailand you must buy a good travel insurance. We use World Nomads to protect ourselves and our stuff. When I got really sick and was rushed to the hospital in Thailand, they covered all my expenses. Also, don’t be too flashy, keep your money and passport in a safe place. We use a money belt for our passports, big money and bank cards. If you need to exchange money, do it in a bank, it’s safer and they have good rates. Another travel tip for your first time in Bangkok: ask the hotel reception to write in Thai the name, the address and the phone number of your Hotel, so you can show it to a taxi driver or to any local in case of emergency. First Time in Bangkok: How to avoid scams? You stop a taxi or a tuk-tuk, tell the driver you want to go to the Grand Palace, or any other attraction in Bangkok and the driver tell you the place is closed. “It’s closed today my friend, but I can take you to another beautiful temple, and you can go shopping”. Those are the magical words, immediately get out of the car and walk away. This is one of the most common scams in Bangkok, every day dozen of tourists end up going to jewelry shops, tailors and being threatened by taxi drivers and people from the shops. 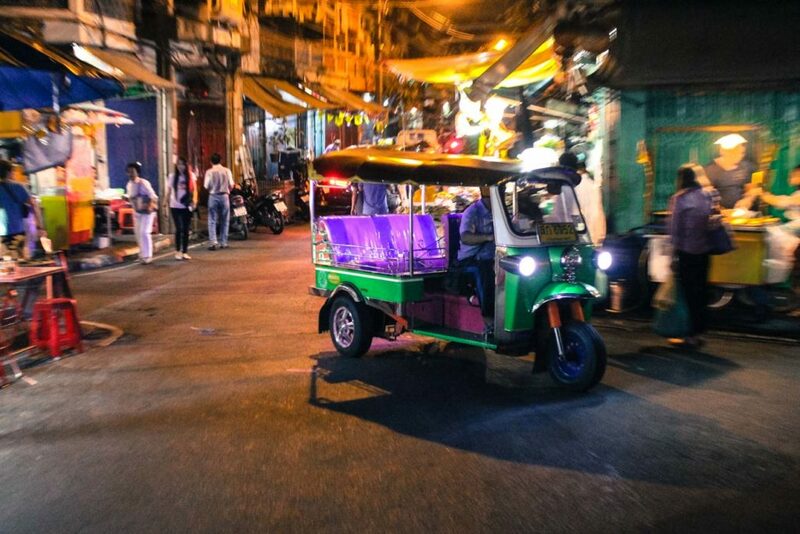 Thailand is a cheap country, so if someone offers you a super cheap tuk-tuk or taxi ride you should run away [again]. Probably the driver will take you to a tour operator, a shop or restaurant instead of drive to the destination you asked for. They do that because the shops and restaurants pay him a commission, so he doesn’t need to make money from the taxi ride. > I have a friend that can help you, very very cheap! Again, be careful! Thai people are genuinely nice and helpful, but too many promises should make you think twice. If you have problems or any doubt about the city, ask to your hotel reception or call the Tourist Police 1155, it’s free for any number. > You need to buy pants! 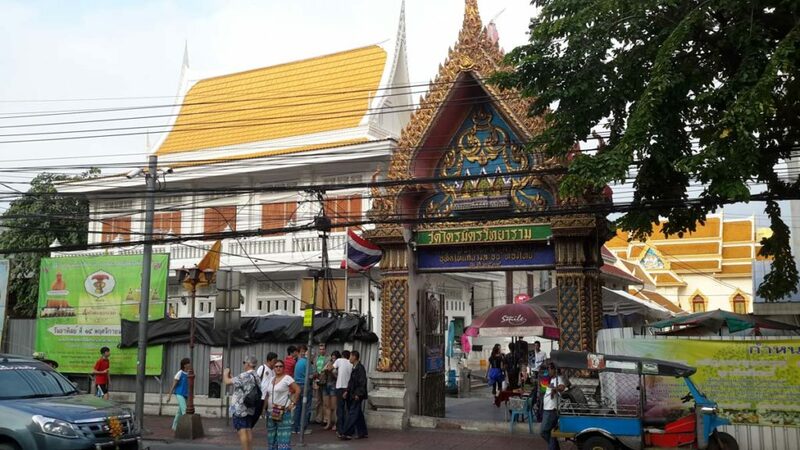 In front of the Grand Palace and other tourist attractions you will see street stalls selling pants, scarves, sarongs and offering “official” tour guides. They will explain to you that to go inside the temple you need to wear a proper pants and cover your shoulders, and you MUST buy from them, because there is no other option inside the temple. Part of this statement is true, you must dress respectfully to get inside the temples in Bangkok, but the other part is a lie. Inside the temples you get FREE sarongs and scarves to cover yourself, and at the Grand Palace you need to rent it, around 30 to 50 bath the piece. Photo by Food Fun Travel. Every year hundreds of tourist get scammed on the red light district and ping pong shows. There is no problem to enjoy the naughty nightlife of Bangkok, but do it in a safe way. So, it’s your first time in Bangkok, what to do if you wanna to go to a ping pong show? First: never trust a taxi or tuk-tuk driver that approaches you in the middle of the street offering a good and cheap ping pong show. Scam Alert! He will take you to a dodgy place, and you will put yourself on serious risk. 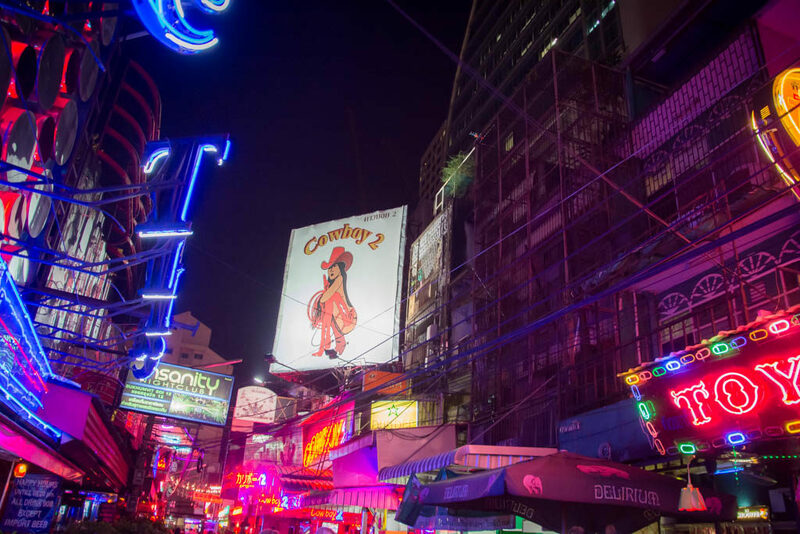 To go to the girls bar, the best option is to get a normal taxi [Grab Taxi or Uber work fine] and ask the driver to take you to Soi Cowboy [the most organized red light district in Bangkok], Patpong [the most touristy one], or Nana Plaza [in the heart of Sukhumvit]. Before entering the bar check the entrance fee, the prices and the rules. Now you know almost everything! How to plan the itinerary for your first time in Bangkok, what to do, attractions, where to stay in Bangkok, safety issues and even how to avoid scams. This is the longest post we have on our blog and believe me, we didn’t cover all the things to do in Bangkok. If you are staying more than 5 days and have the energy to explore further, we have one more travel guide for you: unique and cool things to do in Bangkok, like the second step from your first-time guide to Bangkok. If you wanna plan your travel budget, we have another post for you: how much you need to travel in Bangkok and in Thailand, check it out. Love it?! Pit it for later!! Still have doubts about how to organize your first trip to Bangkok, what to do and where to stay? Don’t be shy, leave a question in the comments below. And don’t forget to book your hotels and tour through our links, doing that you help us to keep writing great travel guides like this one! What an incredible post! Really comprehensive, it definitely has everything you need for your visit to Bangkok. Makes me miss SE Asia even more. I’ll be back in January, but it’s not soon enough. Good to know you are coming back!! I believe we can’t get enough of Bangkok!! You’re right that Bangkok can be overwhelming. It’s a massive and busy Asian city. We really enjoyed visiting the Taling Chan floating market, which definitely didn’t have any tourists. We just took a taxi, which wasn’t very expensive, there and ate our way through whatever looked good. We also enjoyed Asiatique and going on the big ferris wheel. We didn’t go to the Ferris Wheel, but it seems that you can have an amazing view from there. Thanks for the great guide with so much good information! 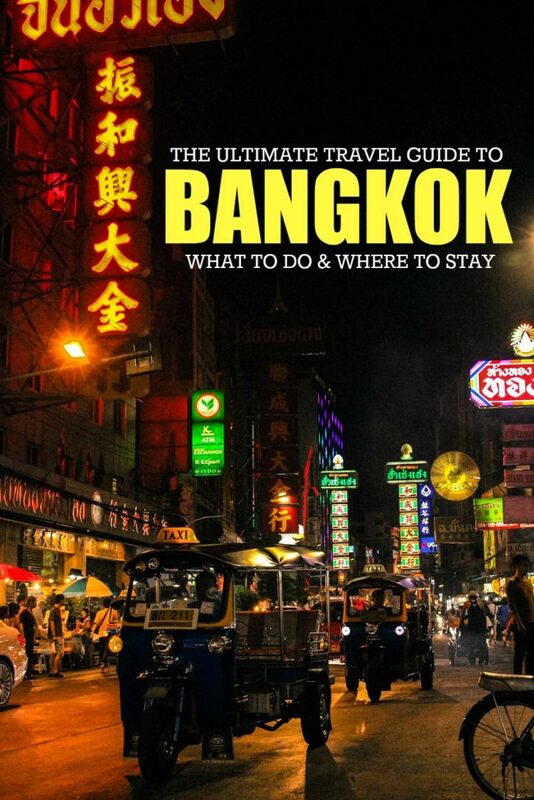 We haven’t been to Bangkok yet, but this will be super helpful for when we finally visit. Everything looks fantastic–the details at Wat Pho are amazing, the floating market looks so cool and the rooftop bars look great, too! You need to come to Bangkok, it’s such a unique city! Holy cow!! What a wealth of information. This is awesome guys so useful for first timers in Bangkok! Awesome guide! I have been to Bangkok a few times and those were definitely the places and things I did as a first time tourist. Great tips for those planning their trip! Hey Darlene, I’m glad that you liked the post! Great compliment coming from someone that already visited Bangkok! We are quite alike, I also try to see and visit as much as possible, I hate that feeling when I arrive home and discover that I have missed an important attraction during the trip… When you decide to come to Bangkok give us a shout, I’m more than happy to share more info! Natalie, this is a great guide! We’ve never been to Thailand, but definitely want to soon. The Pad Thai feast looks amazing! Thanks for covering a little bit of everything – very handy. Safe travels and keep writing! Bangkok is a huge city, we tried to cover and show as much as possible. I’m glad you liked the post!! Great tips, I couldn’t agree more on most of them. I’m heading back to Thailand for my second time soon but am flying directly yo Phuket but I’ll definitely keep this blog in mind for the future as it’s always great to re-read for inspiration! Enjoy Phuket, I love that Islands, so many beautiful beaches and hidden places. This is such a useful travel guide. I have never actually been to Thailand but thinking a trip next year might be in order. Will be bookmarking this! Thailand is an amazing country Anita, for sure you need to come over to explore Bangkok and the islands. Sounds like you have a plan! Enjoy BKK! I’ve been to Bangkok a few times, but I think that is a very useful guide to a first-timer. I guess I wouldn’t stay in Khao San Road again though – it was quite ok when I was younger and newer to the world of backpacking, now I’d definitely look for something away from all that noise. Rambutree is a quieter road just beside Khao San. Although there are so many great places to stay all around BKK. It will definitely help me during my next trip BKK. So many thing that I didn’t cover in the first one. Awesome post. I have been 7 times in Bangkok and it’s one of my facorite city in Asia. Loved read again about şt. Bangkok is one of our favorite cities too!! We learned to love it! The great thing about Bangkok is that every time you go there, you can have a totally different experience depending on where you’re gonna stay or what you’re gonna do. I love it and I can never get enough of it even though I’m not a fan of big cities. Great article! This is an awesome post. Definitely something I wanted to read since I will be traveling for the first time to Thailand. I do have a question on the sim cards, what type of phone did you guys use. I have apple iPhone and wanted to see if the sim card is compatible. Rob has an Iphone 6 and I have a Huawei P9 (Android), but in any shop you can get all sizes of SIM Card, they even instal it on your phone for you. The only think is that your phone needs to be unlocked to work with a Thai SIM card. Enjoy! Bangkok is a great place!!!! Hi Natalie, Travelling to Bangkok with my teens to see Coldplay. Thanks for the hints. Tourist SIM card fab! Will limit shopping to EMQuarter, AsiaTique… anywhere else? Catuchak market sounds amazing, giant buddha… any other musts?? I’m so happy you liked the post! I’m sure it will be an amazing trip! I think you and the teens would love a nice bike trip to Bang Krachao, one of the islands in the middle of ChaoPraya River. You can find more info about this island and other cool things to do in Bangkok in this post. About shopping, Central World and Siam Paragon are other good options. Have a great trip, enjoy Bangkok! I am so glad I found your site! going for a 2 week holiday at the end of May to Bangkok and thinking of going to Krabi. Any suggestions for a cool place to stay at the beach for a solo female traveler over the age of 40? Where would you recommend if I wanted to hear some good house music during my travels? 9 Bar at Khao San Road has great DJs playing house & techno. We love 2 places in Aonang(near krabi) Alisea Boutique and Aonang Cliff Beach Resort. Both hotels are great! This is such an awesome and informative post. Exactly what i needed. We leave to Bangkok in two days and after reading your post it makes me feel a little prepared. Thank you. Glad you liked! Enjoy Thailand! This was just SO HELPFUL! You are welcome, we are happy to help! Air Asia, Scoot, Bangkok Airways, Thai Lion Air have direct flights from Phuket to BKK. 1) How do we bargain while shopping, since there is a language barrier? 2) For first time travel, is it fine to plan by ourself or plan via some MMT or thomas cook etc? 3) How much currency should we carry from India? How much does it cost to withdraw money there from ATM? Which is better? 1 – Most of the vendors do speak English. The necessary to negotiate a deal. 2 – It’s pretty easy to organise the trip by yourself. We recommend Agoda for booking hotels, Skyscanner for flights and TakeMeTour for tours. So much info. Great sit. Question Is there a site that you recommend that does package deals eg. air/hotel/guided tours? Sorry can’t help on that one… we always book our hotels, flights and tours by ourselves. Bangkok is my favorite place in the world. I am very happy with the text. Great advice!! Still a bit overwhelmed …We will be in Bangkok for only 2 days then off to Krabi and Koh Lanta. Do you recommend booking internal flights sooner then later? Do you have a printer friendly version we can take with? Leaving this Tuesday! So excited!! I would recommend the internal flights in advance. Keep an eye on Air Asia, Nok Air and Scoot, usually they have good rates. We don’t have a PDF or printer friendly version of the post but you can save it on Pocket, and read it later even offline. Loved this blog! It will be our first trip to Asia and could not be more excited! We are staying at the Lamphu Tree Hotel for 4 nights at the beginning of our 6 week trip (2 weeks each in Thailand, Cambodia and Sri Lanka) and will have one afternoon at the end of our trip (shopping!). I have not booked our last night yet as I am not sure which part of the city I should stay in. I was looking at the Shanghai Mansion Hotel in Chinatown but not sure if that will be around any good shopping? When I say shopping I don’t mean big malls! I would be interested in local art, unique gifts. I don’t know how often you update your blog, wondering if there are any things you would suggest for a January 2019 trip that are not currently in your blog? Thanks! Your blog was the most comprehensive article I could find on what to do in Bangkok. Chinatown is definitely a great area to do some shopping. There you will find everything, from cheap fake stuff to antiques. This year I’ve visited Lhong 1919 and loved it. Old warehouses turned into shops and restaurants facing the river, there are a few local designer shops there. Another place that I like is the Rod Fai Market near Esplanade Shopping Mall, some local designers tons of food and a nice atmosphere. If you stay in Chinatown, Siam or Silom areas you can easily take a tuk tuk to Lhong 1919 or Rod Fai Market. Your post is really informative for first time travellers. We will be reaching Bangkok around afternoon around 3pm. Can you guide us on what should we plan for that day. We will have another two days on our way back from Krabi. All the main attractions are listed in the article, suggest to pick the ones you like the most and plan from there. What caused you to get ill in Thailand? I know you have to be careful with the food, but was that ever an issue for you or your partner? No, nothing related to food.